You are here: Home / Defense / Would You Survive A Home Invasion? 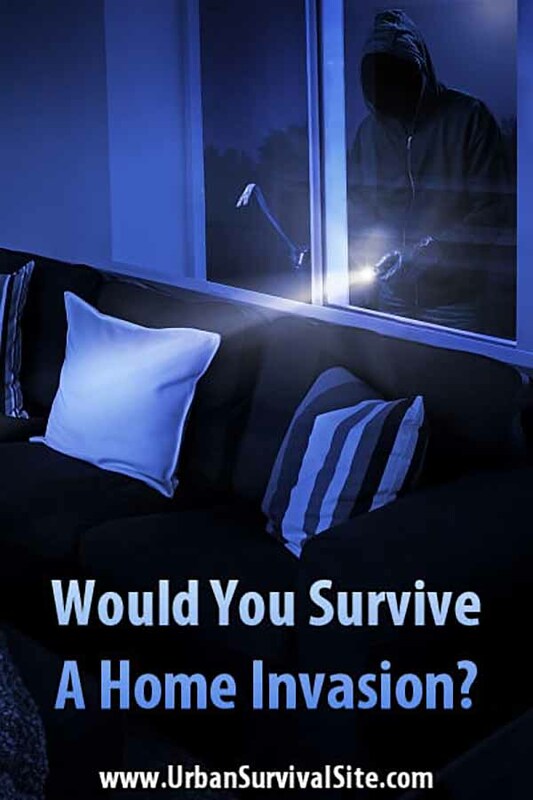 Would You Survive A Home Invasion? Those of us who live in the United States are lucky to live in a nation where home invasions are relatively rare. ABC Australia news and the Daily Telegraph Australia have reported a sharp increase in home invasions recently, going as far as to call the rise in crime a fad. Again, we are lucky we haven’t seen a rise in home invasions over here. Having said that, we can’t deny that they do happen. And when they do, they are often violent. A home invasion is much more than a simple burglary. Most burglars are not looking for a violent encounter; they are just looking for free stuff. Home invaders are different–they want violence, and they want to harm others. Women specifically are targeted by home invaders, and are often victims of violent sexual assault. Trying to get into the mind of the home invader isn’t easy for normal people. A home invader knows what they are doing is much riskier than a simple burglary, so why they do they do it? There are many answers, but the more important question is: How do we stop them? First off, there are a few home improvements you can do to prevent a home invasion. There is one thing a military offensive has in common with a home invasion: they both run off momentum. If you can stop, or at least slow, an attack’s momentum you can beat it before it starts. A home invasion relies on getting in quick before a neighbor gets nosy or a vehicle drives by. For example, if a home invader meets a heavy wooden door equipped with a heavy duty frame, it may change their mind about invading your house. These doors can be attractive and designed to match typical home decor. But they can also be expensive, so a cheaper option is utilizing a heavy duty lock. Also, if your door is decorated with large windows, you should nix those. Or follow the rules regarding windows, something I talk about below. There are a few cost-effective methods to protect your windows. A lot of people don’t want bars on the windows of their home, and that’s understandable. Another option is security film that coats your window without an unsightly addition. This film works by holding the window together. Even when struck and shattered, the film will prevent anyone from gaining access. This film is handy when it comes to bad weather, and it’s great for blocking heat from coming through your windows. On the outside of your home, you can plant thorny bushes under your windows to discourage intruders. These bushes should be thick and high and difficult to walk through. My favorite is the bougainvillea plant–it leaves a nasty prick that is quite painful and long-lasting. Plus, it has pretty purple flowers. Also, keep in mind that stronger doors can increase a home’s value, security film can lower your electric bill during the summer, and flowers are pretty regardless of their thorns. The best defense is a good offense, right? That is where the most efficient weapon you can afford and easily use comes into play. What is that weapon? A gun! No big surprise there. A gun is the most efficient and easy-to-use weapon against invaders. What kind of gun, though? Since home invasions happen fast and are impossible to predict, the best weapon is the one you can carry with you. I am an advocate for home carry. That’s right, carrying a gun at home. I carry concealed every day. Why would I need to take it off at home? If you live in a state where concealed carry is nearly impossible, then I still suggest strapping one on every day inside your home. The gun you carry with you is for when you’re caught off guard. But if you have time, you should go get a bigger and better weapon. I suggest a semi-automatic carbine like the AR 15, the AK 47, or even the old school M1 Carbine. These weapons have a high capacity, are lightweight, easy to control, accurate, and powerful enough to change the mind of any intruder. Shotguns are another good choice. They’re usually more affordable, and they’re legal in nearly every state depending on their configuration. The main disadvantages would be the reduced capacity and the relatively high recoil. For your long gun, I suggest equipping it with a light, something nice and bright like a Streamlight TLR 3. Home invasions usually happen at night, so you’ll need a light anyway. A red dot sight like the Bushnell TRS 25 is a welcome addition to any weapon meant to repel invaders. All the steel bars, bulldogs, and minefields in the world can’t keep the unwanted out if you don’t use them. A few personal measures can make a world of difference. For example, you should at least look through a peephole or out the window before answering your door. Many home invaders wait until someone opens the door a crack, then they kick it in and push their way into the home. If this happens, all your security measures will have gone to waste. If someone comes to the door begging to use a phone, simply tell them that you can call anyone they need you to call, including the police. There is no reason to open the door. Be wary of uninvited solicitors, “repair men” from building maintenance, or any unfamiliar individuals. Always call and confirm before you open the door. Keep a phone nearby of course–most of us own cell phones so this isn’t an issue. You may need it on hand at a moment’s notice to call the police. If you are planning to keep your gun locked up, you should keep a flashlight near the safe for easy access in the dark, or get a safe that is easy to open in the dark. You should also have a plan that your entire family understands. In the event of an attack you should be able to relay a password that lets people know what is happening. Then the rest of the plan should come into action. This plan should involve all members of your family. The main objective should be to get your family to a safe area and to defend that area. No TV is worth risking your life. If you can get your family to safety, you should hole up and establish a defense. Since it’s possible you won’t have time to get to that safe room, another adult should be in charge of getting any children or other folks incapable of fighting back into that room. So once you’re in that room and the door comes down, what do you do? You fight. You fight harder than you’ve ever fought before. At that point, your life is on the line, and the lives of your family are on the line, so you don’t hesitate. You shoot fast and you shoot straight. To be able to do this, you need to go and train with your weapon. I recommend getting professional firearm training. It can be both interesting and exciting. Defending against a home invasion is no easy task. But if you’re prepared, you can prevent or survive any attack. I favor a handgun for house protection. A revolver in 45 Colt is my favorite. Loaded with high grain +P Buffalo Bore JHP Ammo. As deadly as it gets. The biggest problem is when an intruder gets the drop on you, this is my biggest concern. If I’m forewarned, they’re getting hurt. But if I’m awakened by an intruder standing at the foot of my bed? That is a problem and at that point, the battle is about lost. That’s where alarms come in handy as well as a barking dog. We sleep upstairs in our house, so a door locked the top of the stairs is in place to circumvent the mentioned problem. Once we know they’re inside and are awake and armed, we have a good chance of defeating the invader. Practice your movements for this situation. Know where you’ll best have cover and where to aim from. From my doorway I’d stand on the side where just my shooting hand sticks out, not my body. Sitting in your favorite spot watching TV, having a weapon close by is prudent. Lol lol like your comment!